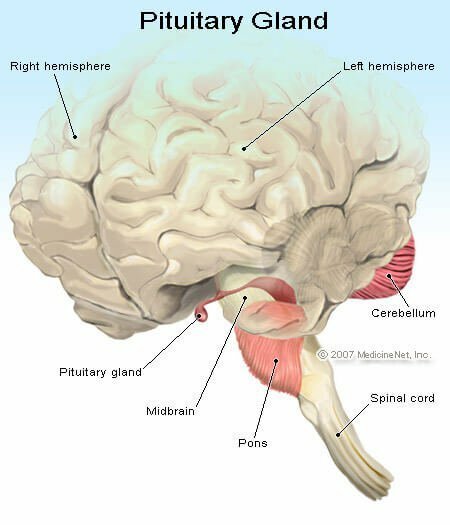 Anterior pituitary: The front portion of the pituitary, a small gland in the head called the master gland. Hormones secreted by the anterior pituitary influence growth, sexual development, skin pigmentation, thyroid function, and adrenocortical function. These influences are exerted through the effects of pituitary hormones on other endocrine glands except for growth hormone which acts directly on cells. The effects of underfunction of the anterior pituitary include growth retardation (dwarfism) in childhood and a decrease in all other endocrine gland functions normally under the control of the anterior pituitary (except the parathyroid glands). The results of overfunction of the anterior pituitary include overgrowth (gigantism) in children and a condition called acromegaly in adults.